A perfect gift for those who were alive during the depression, this Drink-O-Matic holds 10 cans at 30-degrees less than room temperature. 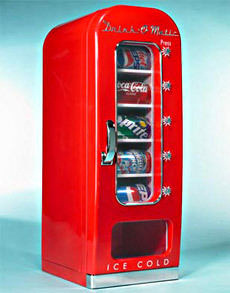 Essentially a small refrigerator made just for drinks, this thing will set you back $149.95, which in Grandpa-money is like 847 Werther's Originals. Better get one before he dies.